I wanted to share something we’re working on here at Tribality. Please check out the new website. We’re hoping to launch a Kickstarter campaign shortly to pre-sell PDFs and hardcover books and fund even more artwork. The books is pretty far along and it is really exciting to move from producing shorter PDFs to an entire book. 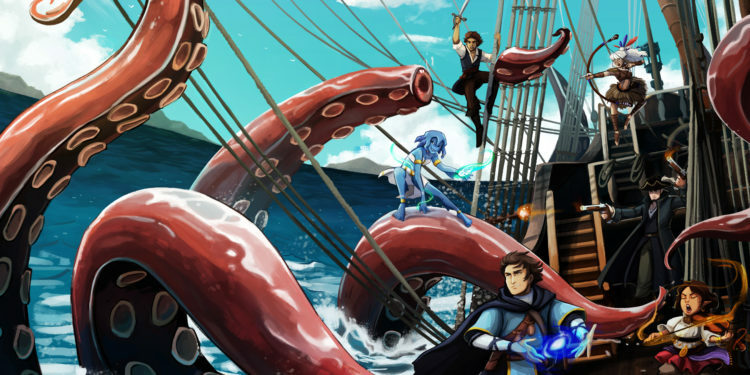 The Seas of Vodari Campaign Guide provides GMs with material to run an entire seafaring campaign or just an adventure full of sea monsters, exploring mysterious islands, following maps to buried treasure or battling cutthroat pirates. Over twenty new weapons, armor options geared towards seafaring and 40+ new equipment options for your players. Forty new spells and fifty new magical items, including powerful relics created by the ancients lost to hunt for. 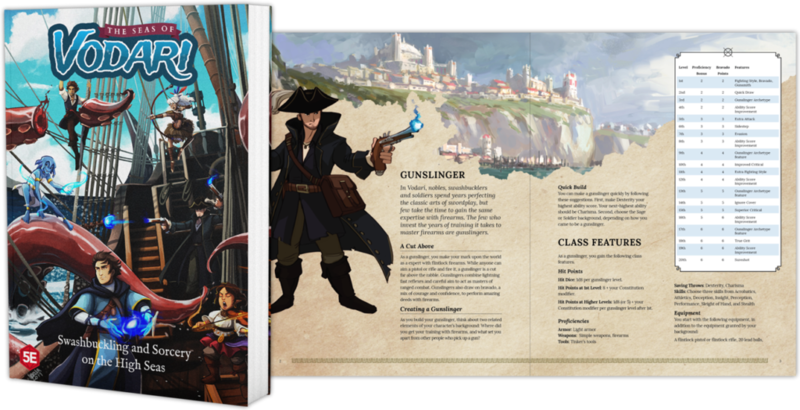 Run swashbuckling adventures in a seafaring world with advice and rules including social combat, naval chases, and the code of the sea. Island with No Name starter adventure for player character levels 1 to 3. Six scenarios including a haunted ship and treasure hunt. 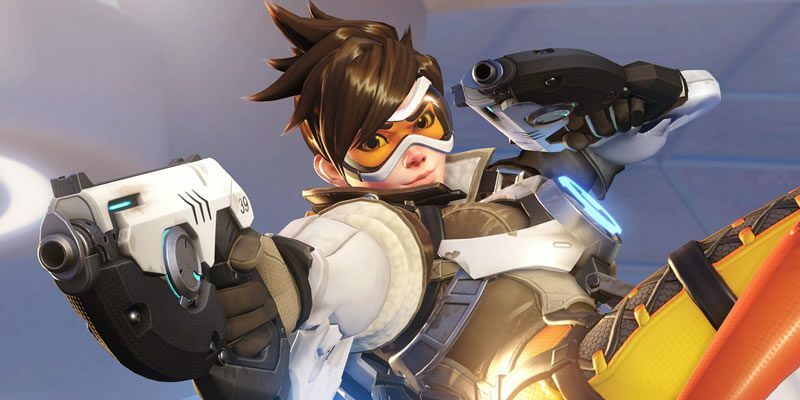 Twenty NPCs for your players to befriend and or make enemies of. Stats, motivations, illustrations and more will be provided for each. Forty monsters to challenge your players including sea dragons, windskipper riding goblins, sirens, and sea titans. 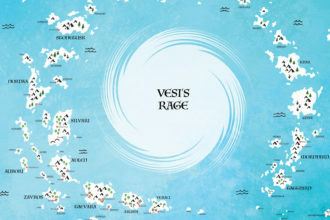 Vodari is a world that grew out of various one-shots and full campaigns I have run for players over the years. I created this world to provide my players with new experiences, when traveling across the monster filled wilderness between exciting locations. I thought that sailing from location to location would make typical wilderness travel feel completely new. I filled Vodari with islands for us to explore, with the next adventure just over the horizon. I wanted to run more than just a pirate campaign, so the islands and inhabitants vary widely from the frigid north to the scorching south. Vodari was inspired by stories full of adventure, exploration and intrigue such as The Three Musketeers, Star Trek, Stardust, Pirates of the Caribbean, Zorro, Indiana Jones, The Count of Monte Cristo and Treasure Island. Adventures on The Seas of Vodari typically focus on the crew of a ship hunting sea monsters, exploring mysterious uncharted islands, visiting bustling port cities, following maps to find buried treasure, and battling cutthroat pirates and raging barbarians. The setting is also well suited to running campaigns in its large port cities, with swashbuckling heroes getting mixed up with fierce rivals, notorious crime syndicates, feuding nobles, and scheming politicians. Vodari contains all of the iconic things you’d expect in a fantasy setting, but in a world with more water than land, much of the familiar becomes surprising and new. Dungeons can be found below the waves in the form of shipwrecks and lost cities. Goblin bandits attack seaside colonies, escaping on waveskippers to their hideouts. Isolated pockets of civilization are replaced by bustling ports filled with travelers from distant islands. Halflings are found living in floating villages made of interconnected boats and anything else that can float. Dwarves are respected shipbuilders sailing the seas in a search for relics from their sunken homeland. Elves are found living high in the treetops and far below the surface of the seas. Gnomes find themselves on opposite sides of a battle of new technology versus nature. Land armies shift into imperial navies that battle to control trade and colonies. The most dangerous monsters are found below the waves, such as sea dragons, megalodons and krakens. Nature becomes as deadly as the most powerful monsters with furious hurricanes, catastrophic tsunamis, and fiery volcanoes.